Poland and Ukraine have been warned by governing body Uefa to speed up their preparations for Euro 2012. There have been concerns that political change in both countries has affected projects such as stadiums and roads. "The next four to six months will be crucial to avoid any critical slippage in infrastructure projects," said Uefa president Michel Platini. Uefa general secretary David Taylor added: "There has been progress, but it needs to be accelerated." Platini made the statement after a two-day meeting of Uefa's executive committee in Zagreb which reviewed a report on the progress the two countries have made. 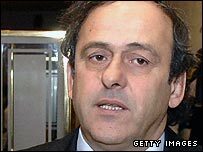 However, with new governments elected at the end of last year, Platini hopes that preparations can continue without hinderence. "There is a need for creating government mobilisation by making the national authorities aware of the crucial need to set up a governance and management structure to lead all the projects related to Euro 2012," he added. "Uefa is totally committed to do everything possible, in the next few months, to assist and support the two associations, at both the advisory and administrative level and political level in order to guarantee the success of the project." The hosts have pledged that there is no danger of them failing to stage the event. "The situation is very clear now and we have new authorities which are determined to fulfil all obligations," said Polish Football Association president Michal Listkiewicz. "Uefa is aware, as we are, that it will not be possible to complete some of the stadiums by the mid-2010 deadline as planned but there is no reason to panic and we have asked the soccer body to extend the deadline by six to eight months. "The situation has improved in the last few months and there is no danger of not meeting all the requirements on time." Listkiewicz's Ukrainian counterpart Grigoriy Surkis added: "Political stability is crucial and it's now showing in both countries, which gives us a great opportunity to catch up." Taylor pledged Uefa's full support to the hosts and said there were no plans to move the tournament to another country. "We are not thinking about that at all at the moment," he said. "There were some difficulties but these difficulties are now behind us. "The two governments are committed to making this work. "We certainly are not in the position of approaching and discussing alternative locations with any country at this stage at all. We categorically deny that."